I never really intended to write a post about killing animals for food, but while perusing the blogs I like to read, I came upon a great article written by one of my favorite bloggers, Hunter Angler Gardener Cook’s, Hank Shaw. Hank’s blog discusses in detail the natural way of procuring his food. Hank is “old school” in that he hunts, fishes, gardens and forages for his food. Hank doesn’t waste anything. His recipes include vegetarian dishes, because naturally we don’t always have game around and we need fiber in our diet too. As you might be aware for almost 3 months I’ve been experimenting with a completely plant-based diet with some success. As I try to explain to curious meat eaters that question my choice, I am not doing this for any reason other than my personal health. There are a number of reasons to not eat meat, from religious to ethical and I even know a person who doesn’t eat anything with a bone in it or attached to it because they are just plain grossed out by it. I wanted to pass along Hank’s article on killing, because, as he points out, 98 per cent of the people who eat meat have never killed anything larger than an insect unless it was an accident. Many don’t consider that they are killing by proxy when they eat meat from the store or drive there in their car with leather seats or even put on their leather shoes or belt. I’m not a hunter, but I’ve done my share of fishing and I don’t have a problem with killing animals for food. I do detest sport killing though. I have a feeling that animals were a gift to mankind and should be respected and treated as a gift, not to be abused or wasted. 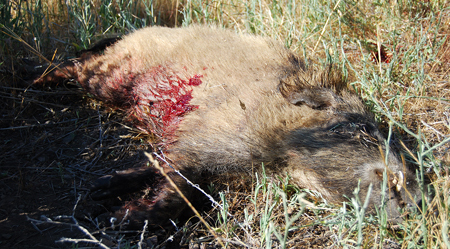 “On Killing” deals with the emotional aspect of killing an animal. A smart hunter does not kill without thinking about the consequences of their actions. My wife’s family and extended family are big hunters, but not one of them takes it for granted. A skilled hunter is in touch with nature and knows the game laws and knows that “harvesting” game is important to the welfare of the species. The days are long gone when teams of men would shoot buffalo from the windows of a passenger train and leave the animal to rot on the ground. The hunters I know thank the animal and God for providing food for their table and family. UPDATE: I want to thank everyone who has responded to this post, both below in the comments section and to me directly via email. More than one of your responses has been so moving it’s stopped me in my tracks. And Zane from Cleveland, your letter choked me up pretty bad. It is rare for me to write about such things; doing so feels like opening a vein in public. I am glad to know that I am not alone out there. Thank you. I have been dealing a lot of death lately. I’ve hunted five of the past eight days, and have killed birds on each trip. My larder is filling, and Holly and I are eating well. Lots of duck, some pheasant and even a little of the venison I have left over from the 2010 season. That is the good side of all this, the side of hunting that most people can embrace. I hunt for a lot of reasons, but for me the endgame is always the table. It is the journey to that table that can sometimes give people pause. What I do to put meat in my freezer is alien to most, anathema to some. In the past seven years, I can count on one hand the times I’ve had to buy meat for the home. This fact alone makes me an outlier, an anomaly. And that I am unashamed — proud, really — of this seems to cause a lot of folks I meet to look at me funny: I am a killer in their midst. Not too long ago, I was at a book signing event for Hunt Gather Cook when a young woman approached me. She was very excited about foraging, and she had loved that section of my book. Then her face darkened. She told me she’d also read my section on hunting. “How can you enjoy killing so much? I just don’t understand it. You seem like such a nice person, too.” It took a few minutes for me to explain myself to her, and I am grateful that she listened. She left, I think, with a different opinion. A few weeks later, I was at the University of Oregon talking about wild food to some students. When I mentioned hunting, I could feel the temperature in the room drop. It occurred to me that no one there was a hunter, nor were they close to any hunters. I called for a show of hands. One guy raised his. I asked him briefly about his hunting experience, and it was obvious that it had been traumatic for the poor kid. I let the topic slide and moved on to mushrooms. When I was in Cambridge, Massachusetts, I spoke with more than 100 diners during my book dinner at Craigie on Main. Only four were hunters, although a few more wanted to start. Over the course of the night, I fielded weird question after weird question from diner after diner. Have I ever shot someone? Did I actually eat what I shot? Wasn’t I afraid of diseases? It was a stark show of ignorance. Not stupidity, mind you, just an utter lack of knowledge of what hunting is all about. To be sure, these encounters were in college towns among a certain set of people. I had some book events, notably those in Montana, Pittsburgh and Austin, where most everyone who attended either hunted or was at least familiar with it. And in most places I could be assured of a healthy smattering of fellow hook-and-bullet types or farmers, who are equally familiar with the death of animals. But the fact remains: Most people reading this have never killed anything larger than an insect, and among those who have it’s usually a been fish, or an accident — like running over someone’s dog. Most people have no idea what it’s like to take the life of another creature, let alone why someone would actively seek to do so. Let me try to explain to you the way I did to my young foraging friend on book tour. Let me tell you what it means to kill, at least for me. To deal death is to experience your world exploding. It is an avalanche of emotion and thought and action. Armed with a shotgun, it is often done without thought, on instinct alone. 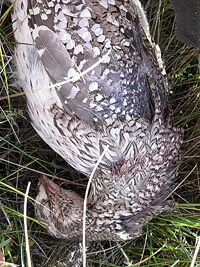 A flushing grouse gives you no more than a few seconds to pull the trigger before it disappears into the alders. A rabbit can leap back into the brambles in even less time. Unless you are perfect in that split second, the animal wins. And being human, we are far from perfect. Even with ducks, where you often have plenty of time to prepare for the shot, their speed and agility are more than adequate defenses. We hunters fail more than we succeed. This is why we will often whoop it up when we finally bring a bird down: We are not being callous, rejoicing in the animal’s death. It is a hard-wired reaction to succeeding at something you have been working for days, months, even years to achieve. In some corner of your brain, it means you will eat today. This reaction can look repulsive from the outside. Should you arm yourself with a rifle, you then must wrestle your conscious mind. Buck fever is real. A huge set of antlers will hypnotize the best of us, man and woman alike. Even if the animal lacks antlers, as mine often do, you have to contend with The Twin Voices: On one shoulder sits a voice shouting, Shoot! Shoot! You might not get another chance! On the other shoulder sits another voice, grave and calm: Be careful. You must not put that bullet in a place where the animal will suffer. Better to pass a shot than wound an animal. A wise hunter does not kill lightly. In that moment when the game shows itself and you ready yourself to shoot, all that matters is that you do your job correctly. And that job is to kill cleanly and quickly. The animal deserves it; we would want no less were the tables turned. And make no mistake: A great many hunters, myself included, do this mental table-turning with some frequency. Seeing animals die so often makes us think of our own death, and I can assure you most of us would rather die with a well-placed shot than wither in a hospital. We also know all too well that we are fallible creatures. When we fail to kill cleanly, when we wound the animals we seek, it is our duty to end their suffering ourselves. If there is a moment in this whole process that breaks my heart, it is this one. Everything wants to live, and will try anything it can to escape you. We see ourselves in this struggle, feel tremendous empathy for the struggling bird, the fleeing deer. It is a soul-searing moment where part of you marvels at the animal’s drive to live — to escape! — at the same time the rest of you is consumed with capturing it as fast as possible so you can end this miserable business. This internal conflict is, to me, what being human is all about. A coyote or a hawk has no remorse. We do. I am not ashamed to tell you that I have shed a tear more than once when I’ve had to deliver the coup de grace to a duck. I’m not sure what it is about ducks, but they affect me more than other animals. I always apologize to it, knowing full well that this is a weak gesture designed mostly to help me feel better. But it does help me feel better. At least a little. So I keep doing it. As the moment of killing fades, death rides home with you in the back of the truck. Once home, you must transmogrify the animal you killed into meat. The transformation is a mystical one, and every time I “dress” game — such a pleasant euphemism, that — I marvel at how fast my mind toggles from hunter to butcher to cook. It is a necessary process, and one that is vital to why I have chosen this life, why I am a hunter. I look down at my keyboard and see death under my fingernails. I smell the fat and gore and meat of dead ducks upon me; it’s been a good week of hunting. And because I eat everything on a duck but the quack, I have become intimate with the insides of waterfowl. Over the years, I’ve gutted and taken apart so many animals that I know the roadmap blindfolded. And that road leads to meals long remembered. I reach into a deer’s guts without thought: I want those kidneys, and that liver. I turn my arm upwards and wrap my fingers around its stopped heart, slick and firm. It will become heart cutlets, or jaeger schnitzel. Once plucked and gutted, I can take apart a duck in 90 seconds. Maybe less. My fingers intuitively know which way and how hard to pluck each feather from a pheasant’s carcass. I know just where to put my boning knife, sharp as lightning, to slice the tendons that hold a hog’s tongue into its head. I use the same knife to caress its hind legs, separating the natural muscle groups apart along each seam. Some will become roasts, others salami. Animal becomes food. The pop of a goose’s thigh bone disjointing from its body no longer sickens me; all it means is that I need to slip my knife under that bone and around the coveted “oyster,” the best bite on any bird. 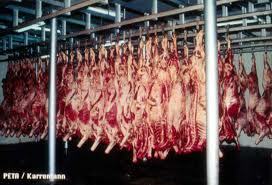 Wasting meat is the sin I cannot forgive. When I kill an animal, its death is on my hands, and those animals to whom I’ve had to deliver the coup de grace are especially close to me. There is a bond between us that requires that I do my part to ensure they did not die for nothing. This is why I spend so much time creating recipes for every part of the animal. Nature wastes nothing, and neither should I. It pains me to know that some hunters do not share this feeling, that they care only for backstraps or breasts — and while I know that coyotes and buzzards will eat what we do not, I do not hunt to feed those creatures. You might ask me that with all this, why bother eating meat at all? Why deal with all the moral and emotional implications? In the face of such constant death, is it not better to be a vegetarian? For me, no. 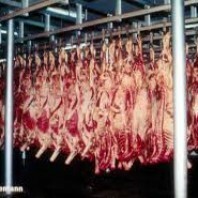 It is a cold fact that no matter what your dietary choice, animals die so you can eat. Just because you choose not to eat the flesh of animals does not mean that their homes did not fall to the plow to become acres of vegetables and soybeans, wheat and corn. Habitat, more than anything, determines the health of a species. The passenger pigeon may have been snuffed out by hunting, but it was the massive destruction of virgin forest — forest cleared to grow crops — that brought the pigeon to the brink. I have nothing against vegetarians, and the vast majority I’ve met understand what I do and respect it. But to those few who do not, I say this: We all have blood on our hands, only I can see mine. It all boils down to intimacy. Hunting has created an uncommon closeness between the animals I pursue, the meat I eat, and my own sense of self. There is a terrible seriousness to it all the underlies the thrill of the chase, the camaraderie of being with my fellow hunters and deep sense of calm I feel when alone in the wild. I welcome this weight: It fuels my desire to make something magical with the mortal remains of the game I manage to bring home. It is a feeling every hunter who’s ever stared into the freezer at that special strip of backstrap, or hard-won bird or beast understands. Meat should be special. It has been for most of human existence. And no modern human understands this more than a hunter. I am at peace with killing my own meat because for me, every duck breast, every boar tongue, every deer heart is a story, not of conquest, but of communion.